However, there are so many cabinet options available today that it would take several articles to cover ever possibility. But, these are the basics that are available through almost all cabinet manufacturers, and it should provide a very good starting point. To begin with, lets take a look at the options for wood choices. These are certainly not all inclusive. There are several more choices if you want to go with something different. However, these are the most common types of wood offered. 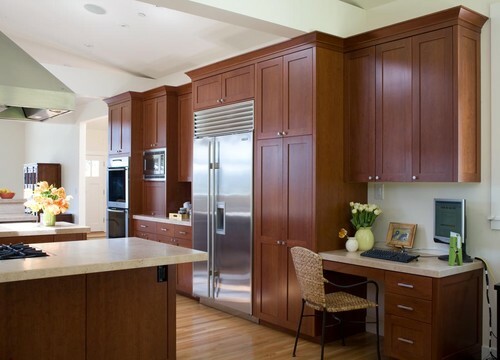 Cherry cabinets have always been a popular choice for cabinetry. It is not the most economical choice, but neither is it the most expensive. 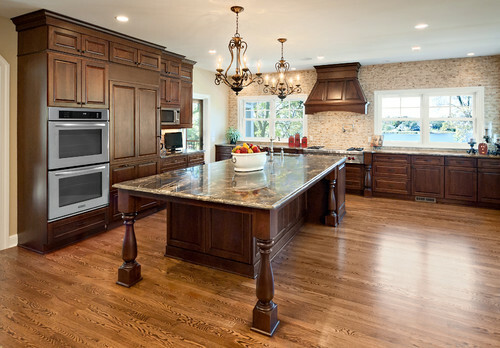 They generally provide a quality cabinet that will stand the test of time. Oak is one of the least expensive wood choices. 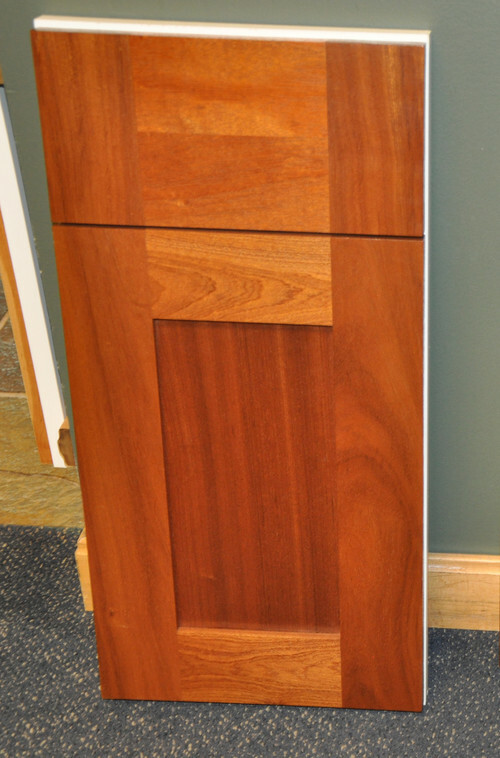 Because of its open grain, it is best suited for stained finishes. It comes in straight sawn varieties (as seen in this image), but can also be constructed from quarter sawn wood. (Quarter sawn wood will be more uniform and will not have the cathedral markings that are seen in straight sawn). 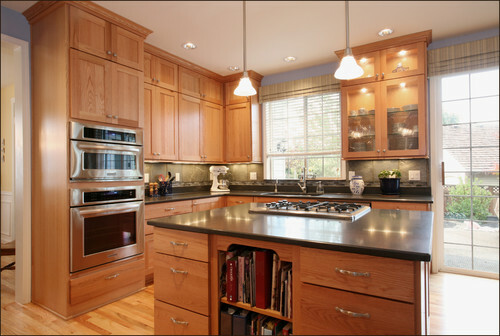 Oak is a very popular choice for the Craftsman style design. 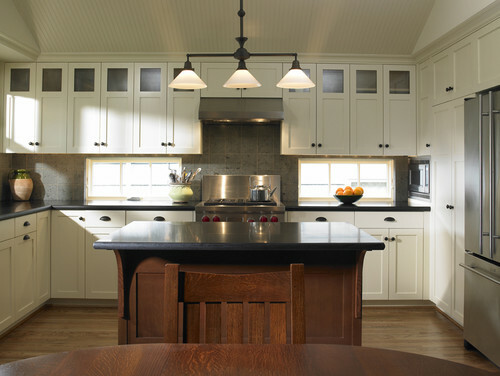 Maple is a hard wood that works very well for cabinets with a painted finish. 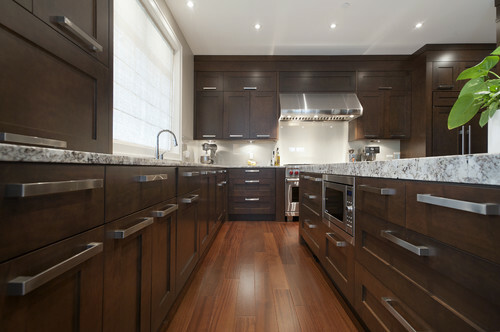 Because it has a tendency to not take stain in a uniform fashion, usually the non painted maple cabinets will have a very light stain or a natural finish, as seen above. 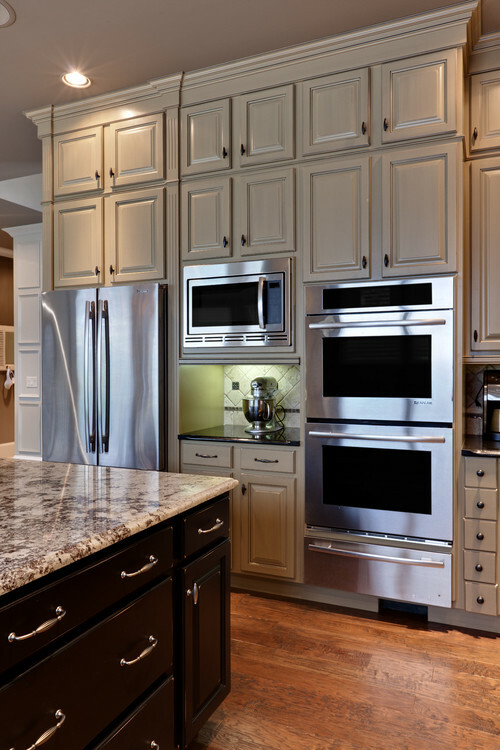 Melamine cabinets are one of the least expensive types of cabinetry material. So, if you are on a really tight budget, this could be the answer. The downside to melamine is that it is terrible at holding onto a screw or a nail. This makes it easier to pull doors from hinges or cause structural damage to the box. If you have a child free home, this may not be an issue. 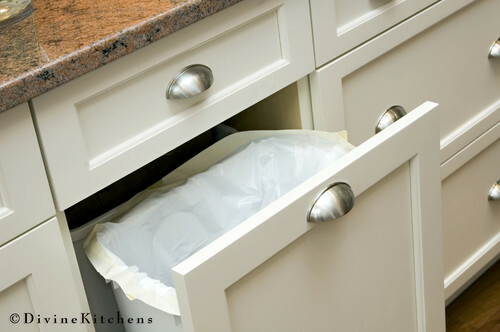 However, if you think that your household will be a little rough on the cabinets, keep this in the back of your mind when making your decision. 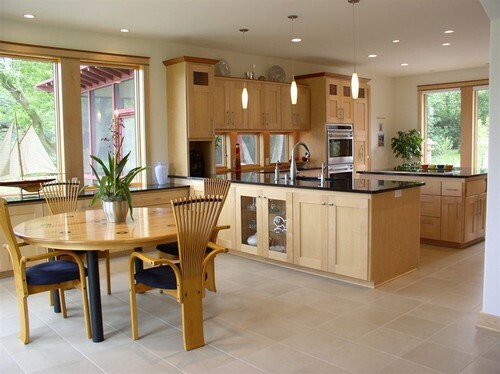 Very popular with Contemporary and Mid-Century Modern styles are the flat panel doors. These look good in melamine, because the finish is so perfect. They also are frequently seen in painted wood (as above) or a stain finish. 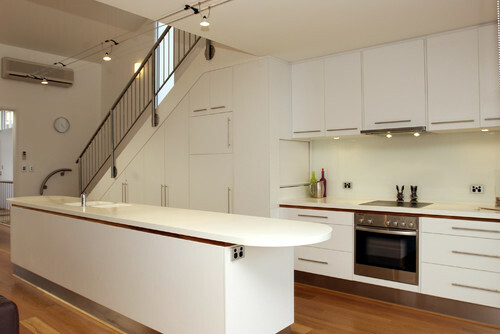 A raised panel cabinet is a very popular choice for the Traditional design style. It is one of the most ornate cabinet doors available. 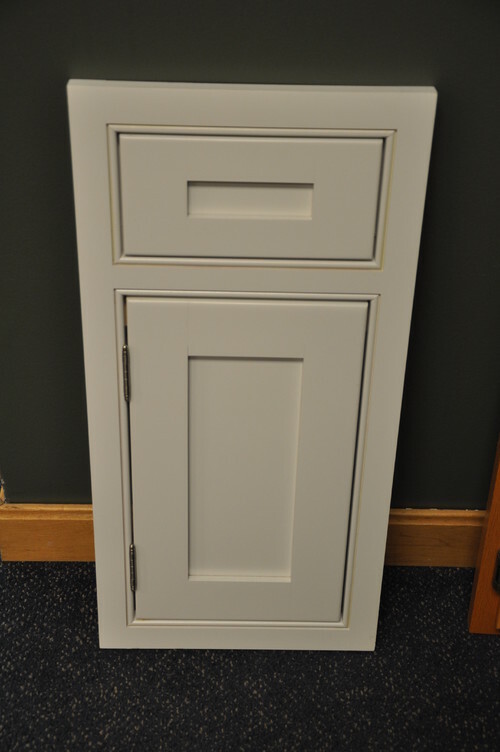 Most manufacturers have their very own unique detailing for the raised panel door, and even those can be elaborated upon. These work well with any finish, but work particularly well with glazes. The above image shows a basic recessed panel door. Notice the similarities to the shaker doors. The one difference here is that this door has an interior profile. 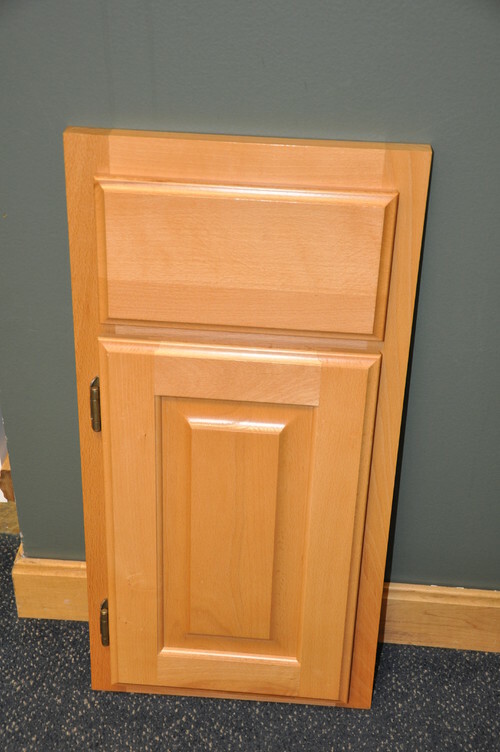 In fact, this is just as often referred to as a “shaker with a profile” as it is a “recessed panel” door. Generally, a recessed panel door will have the same detailing as seen above, but will have a beveled or rounded outer edge to set it apart from the shaker style. However, any door that has a set back panel may be referred to as a recessed door. This is a standard style overlay. It is what will come with the most basic of cabinet doors. It has a face frame, and most of that face frame is visible. 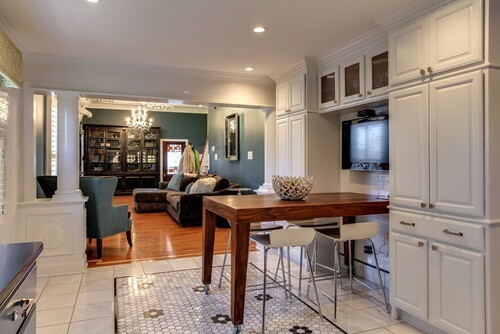 This is a very nice example of a standard overlay on a custom set of cabinets. This is an example of a partial overlay. What counts as partial overlay will vary from manufacturer to manufacturer. But generally, a small amount of the face frame will be visible. It is usually less expensive than a full overlay but more than than the standard. These are partial overlay doors (above). You’ll notice that the drawers extend almost to the edge of the face, and the doors nearly meet in the center with very little face revealed. This is an example of a full overlay door. It is more expensive than the two options above. With this option there will be no face frame visible. 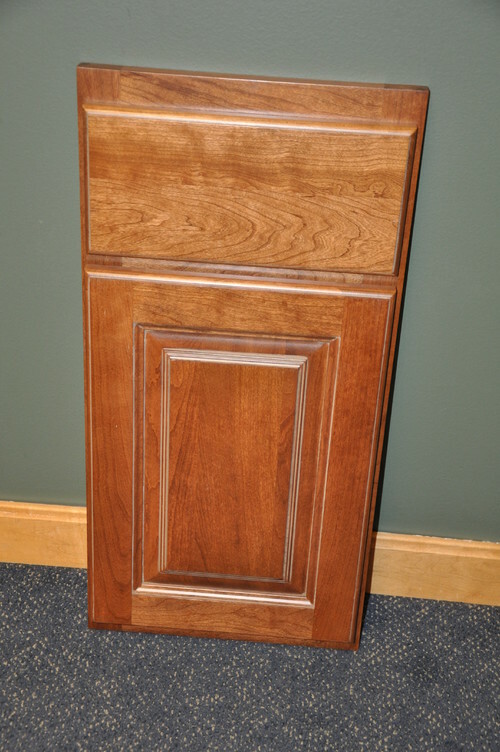 A beautifully done shaker cabinet with full overlay doors. 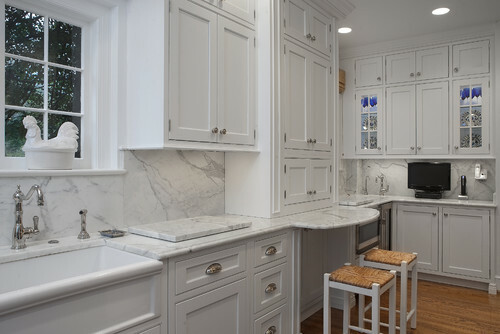 The full overlay gives a very clean and customized look to cabinets. The most expensive of the door styles is generally the inset door. This is an example of one. These require very precise measurements during construction, which contributes to the cost. 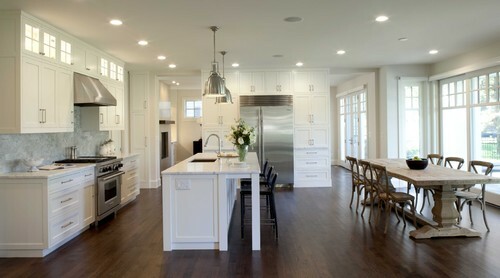 This kitchen has customized cabinets with inset doors. Finally, there are the many, many finish options to choose from. I can not, and will not try to cover them all. But, the basics are listed below. 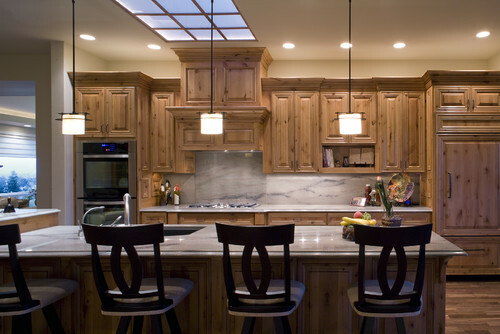 A natural finish is a nice choice if you have chosen a beautiful species of wood, like these knotty alder cabinets above. This also works well when you do not want a color or prefer a neutral shade. Stains come in all shades and tones. Even customized shades can be created. The way that the stain will look will vary from wood species to wood species. The best thing to do if you want a stained cabinet is to determine the shade. Then, ask to see it on different types of wood. 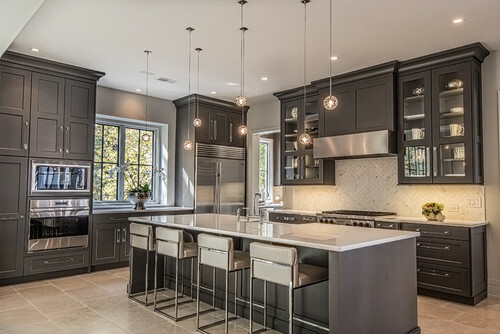 Painted cabinets are the most requested finish for cabinets. There are even more options for paint than there are for stains. 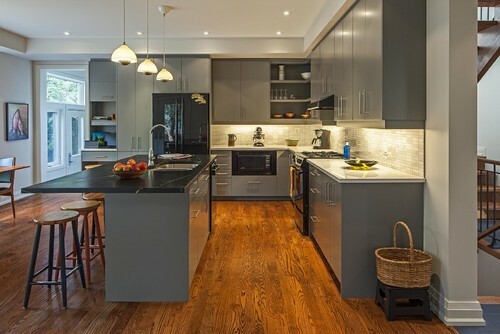 I would suggest taking a color sample to the location where the cabinets will be installed and look at it in different light settings, just as you would do for a wall color. Once a color is decided on, ask to see a sample door in that color, and do the light test again before making a final decision. In addition to stain and paint colors, there are also accents like glazes. These are my cabinets above. They have a vanilla bean paint color with a chocolate glaze. However, glazes also come in different shades of brown, grays, and even black. All will give a different result. 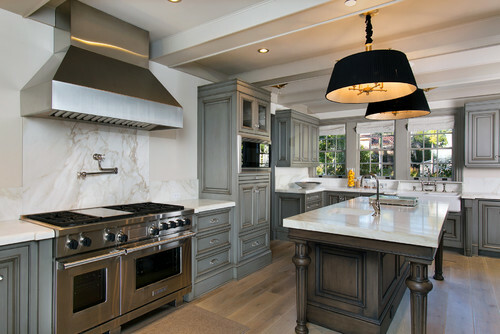 Above is a kitchen that has glaze on both painted and stained (island) cabinets. It is the same chocolate glaze applied to both finishes. These are just some of the basic cabinet options that are offered by most companies. There are countless others. Shop around and make sure that you find exactly what you are looking for before making a decision. After all, cabinets are a major purchase.